. Read on for the goods. A pair of same sized button up shirts or t-shirts. This part is a bit optional – you can use just one shirt to simplify this project. Superglue or a hot glue gun. You’ll want to start off by taking a couple of shirts of contrasting colors. As mentioned before, this step is a optional – if you’d like to simplify the project, simply take a shirt you’d like to use, and skip ahead. If you chose to use two shirts, you’ll want to cut them in half and sew them back together with your sewing kit along the backs seem – this will create a fun two-toned shirt. 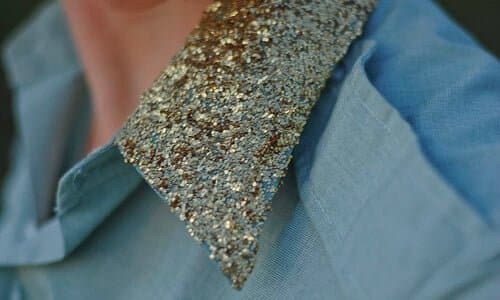 Using a light coating, use your sprinkles liberally along the lapels and sleeves of the shirt. The crystals, or rhinestones, should be applied to the back and front of the shirt. The simplest method involves simply spacing them at random, however you can also create fun patterns and designs. In either case, you’ll want to apply each stone individually with a superglue stick or a hot glue gun. Enjoy!